This is a photo of what, over the last few months, has become my ‘‘double figures’’ T-shirt. Which may seem a bit confusing as it has no figures on it at all, only letters. While it did cost me double figures to buy it – around $20 – that’s not the reason behind the name. I bought it at Wollongong’s Froth and Bubbles beer festival in August 2014. When I bought the shirt it was a little too tight for me to wear – well, not without giving it a ‘‘fat guy who mistakenly thinks he has muscles and wants to show them off’’ look. I’m sure you know what I’m talking about. 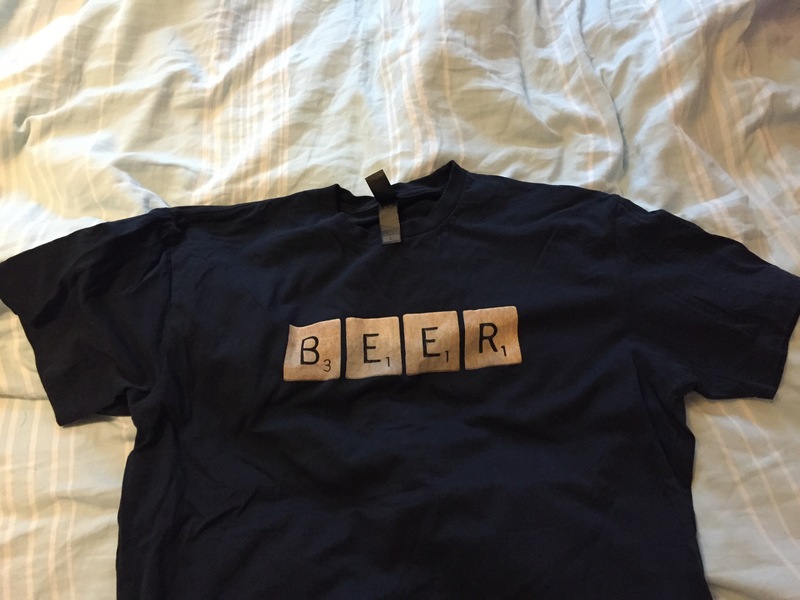 That was a bit of a disappointment, because the shirt locked into two of my geek interests – beer and words (the letters are Scrabble tiles). And so it sat folded up on my T-shirt shelf. For ages. Somewhere between then and now I decided I wouldn’t wear it until I lost some weight and didn’t look like a fatty boomsticks trying to show off his non-existent guns. In late October my brother asked me to be best man at his wedding. This required wearing a very nice suit he gave me. Not wanting to screw it up and not be able to fit into the suit in a just over a month’s time, I pledged to watch my weight. I actually ended up losing a few kilos too. Not long after that, I started thinking about this T-shirt, and it became the ‘‘double figures’’ shirt. Which means ‘‘I won’t wear that shirt until my weight gets down to double figures’’. Yeah, for more than a few years now, I’ve gone over the century mark when I stepped on the scales. Is beer to blame? Yep, but so is sugar and some of the other crap I eat. And an approach to exercise that is not entirely consistent with getting results. I continued the changes that kept me fitting into the suit – drinking less, exercising more – and have since added a few more tweaks. Like drinking more water, finding low sugar alternatives to the foods I eat regularly (like breakfast cereal – who knew Just Right had more than seven teaspoons of sugar per bowl? Not me) and some light weight work. The result has been a gradual movement towards the goal of double figures. So, should you see me sporting this T-shirt, you’ll know I made it. Hopefully that happens soon, I’ve been waiting more than a year to put it on.